Which way for a new version of OpenQuest? OK I’m gearing up to a tenth-anniversary version of OpenQuest in 2019, probably Kickstarting it over the summer. Obviously, I’ve got my thoughts on what I’d like to change. I’ve got two approaches I could take which fall broadly between two extremes. Approach 1. OpenQuest 2 tidied up. Minimal changes, another editorial pass/proof, all new art from the current stable of D101 Artists, reintroduce the Empire of Gatan overview that was taken out in the last version and release the book as an all in one inclusive rulebook. Emphasis on polish rather than big rules changes. Approach 2. OpenQuest 3 a more radical revision of the rules and presentation. Spilt the current 8 by 11 inch 250+ page book into three 6 x 9-inch books: Book 1: Rules + Magic, Book 2 D100 World Builders (GM’s book) Book 3 Bestiary. Under this approach, OpenQuest Basics (the current free pdf/lo-cost 6×9 inch book) becomes a free artless Book 1 in pdf only. Rules would also get a good going over and it would be a proper new version, called OpenQuest 3 – where there would be big changes such as elimination ot the three approaches of magic. I’m running this as a poll over at the OpenQuest forum over at BasicRoleplaying.org, so if you want to add your voice there visit this post. OpenQuest what would you change? So as well as voting for which approach would you favour, what would you want to see changed or sorted out in this version of OpenQuest? Slowly recovering from the awesome that was The Road To Hell Kickstarter, and getting back to the more mundane housework and day-to-day stuff I have to catch up with. One of the things that was Awesome about the KS is that I’ve wanted to play Lamentations of the Flame Princess for a good couple of years (5 or so?) and the playtesting of this scenario (which has had a couple of outings now and has an ongoing playtest at the moment to test last-minute encounter additions) gave that one a good going over on that front. I’ll post more about that later, I’m overdue an appreciation post about LoTFP. Another thing that was awesome about the KS was the fact that it funded and then some, so I’ll be able to take my original idea, pay the artists, pay myself and deliver it in a short time scale. And it’s a model I can use for adventure releases in the future as well. I’ve got another two adventures that follow up Road to Hell (which I’m calling the Jacobean Trilogy for reference) but I’m also thinking about doing something for Mythras, which I’ve also wanted to run for like forever. As I develop the ideas I have for it (in what I call the Fun Phase), I’ll blog about it here. Look out for the tag #makemineMythras. 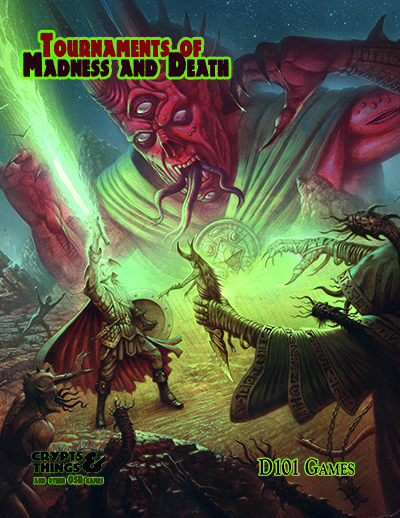 Tournaments of Maddness and Death for Crypts and Things.